I’ve started a new blog – The Baking Goddess – and will no longer be updating this site. An homage to the ultimate home baker – my lovely grandmother, Bonnie Jean – it will feature all kinds of yummy recipes (not just baked goods!). I hope you’ll visit, and enjoy! It’s been a long while since I’ve posted – starting a new job has kept me VERY busy – but I’m thrilled to be back on St. Patrick’s Day sharing this recipe for Irish Cream Chocolate Mousse. Mousses are one of my favorite desserts – they’re quick to assemble, versatile, inexpensive, and decadently rich, not to mention easy to portion and prepare in advance. This recipe – with only 4 ingredients! – combines two classic mousses into one delicious, airy confection. If you don’t like Irish Cream, feel free to substitute with another cream-based liqueur (Dooley’s, Cruzan Rum, etc), or omit it all together. Happy St. Patrick’s Day, and buon appetito! 1. Place the bowl and beaters of an electric mixer in the refrigerator to chill for 15-20 minutes. 2. Melt the dark chocolate in a double broiler over low heat. Remove from heat and allow to cool. 3. While the chocolate is cooling, whip the cream until soft peaks form. Set aside. In a separate bowl, beat the egg yolks until smooth. Stir in the melted chocolate and Irish cream, then fold in 3/4 of the whipped cream. 4. 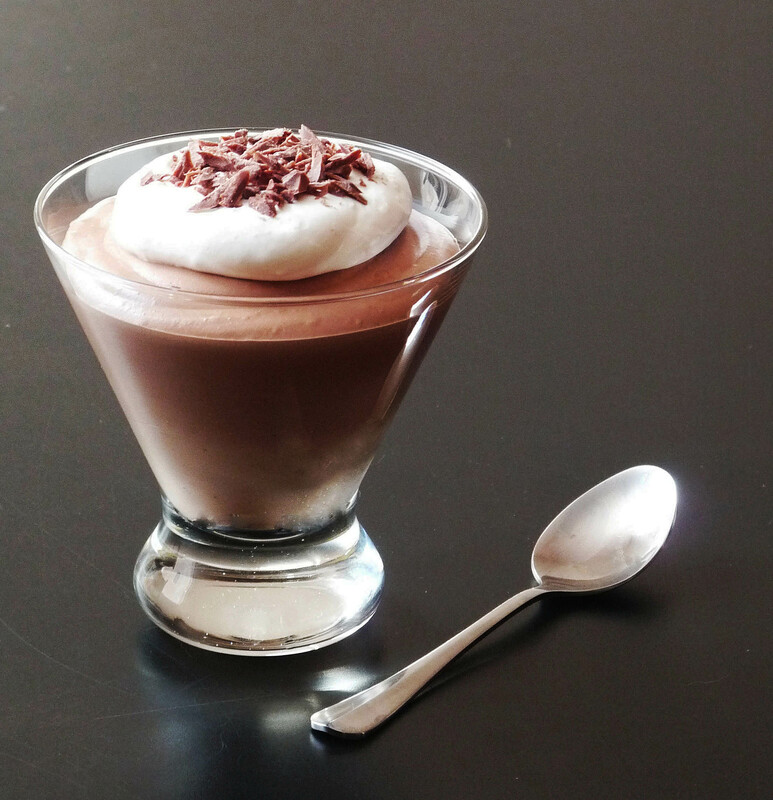 To serve, pour the mousse into serving glasses and garnish with remaining whipped cream and chocolate shavings (optional). I don’t know about everyone else, but I ate WAY too much over Thanksgiving. As in, two full turkey dinners too much. While I’d love to post a new recipe for eggnog doughnuts or mulled wine this week, the safest bet is probably something a wee bit more healthy. 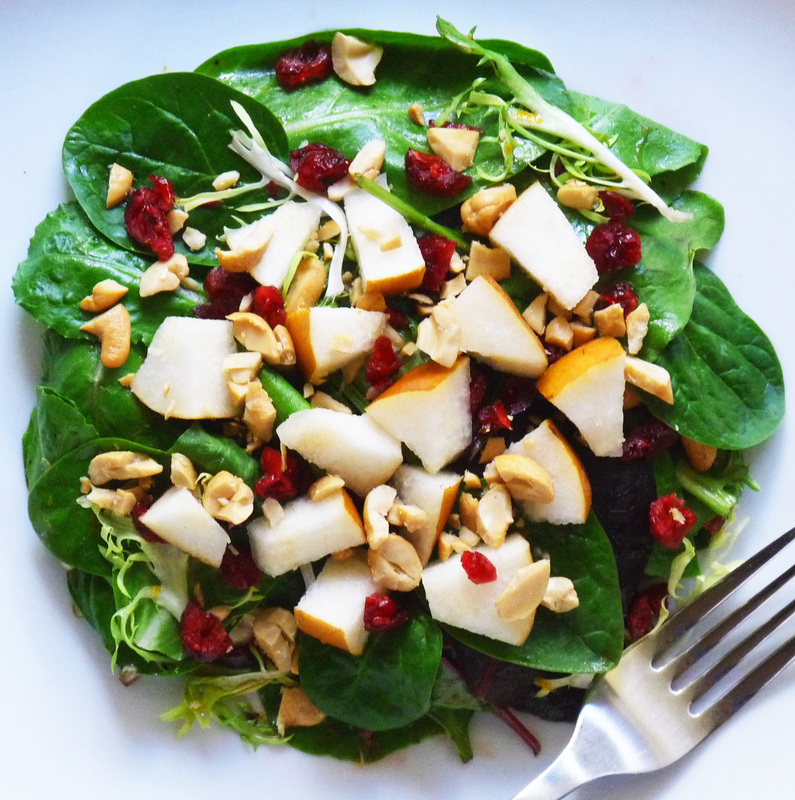 This festively colored salad – with fresh bosc pears, salted cashews, dried cranberries, and a sweet orange-raspberry vinaigrette – perfectly fits the bill. The recipe – originally featured in the December 2000 issue of Sunset magazine – makes 16 small servings, so adjust the ingredients accordingly. Enjoy, and buon appetito! 1. In a wide 10- to 12-quart bowl, mix orange peel, orange juice, vinegar, oil and honey. Add cranberries and stir to incorporate. 2. Rinse, dry, quarter and core pears. Cut lengthwise into ¼-inch-thick slices or chop into 1-inch chunks. Place in bowl with orange mixture and mix gently. 3. Add salad greens and cashews. Mix gently to coat with dressing. Add salt and pepper to taste. It’s with great sadness that I post my last pumpkin recipe of the year. This one – for pumpkin eggnog custard – happens to be one of my favorites, as it’s essentially pumpkin pie filling with a hint of eggnog. 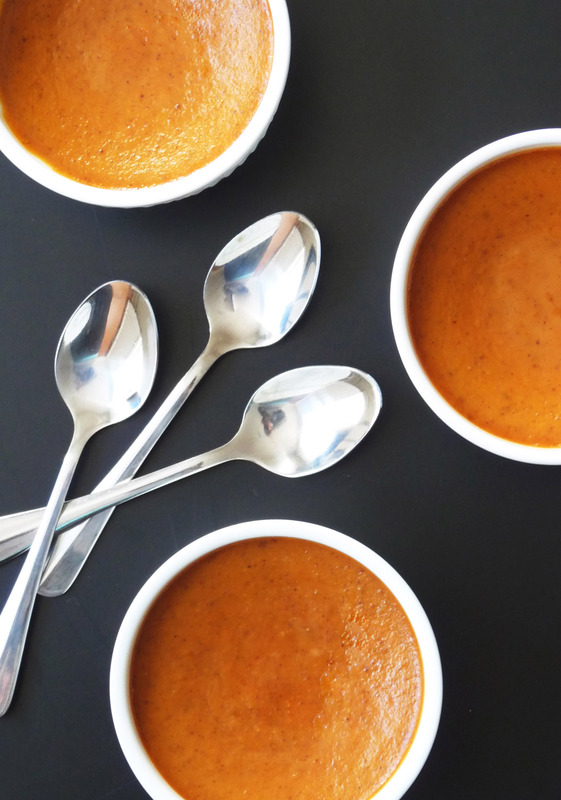 The result is a creamy, rich pumpkin pudding without the hassle of a pie crust. Because seriously, crust … ain’t nobody got time for that! While I’m not a huge fan of pumpkin pie spice (I like the ability to control the amount and variety of spice in the custard), use it if it’s all you have on hand. I also find the custard bakes more evenly when the ramekins are placed in a hot water bath (instructions are below). Enjoy, and buon appetito! 1. Preheat oven to 350 degrees Fahrenheit (175 degrees Celsius). 2. Mix sugar, salt and spices in a small bowl; set aside. In a large bowl, lightly beat eggs. Add pumpkin and sugar-spice mixture and stir until well combined. Gradually stir in evaporated milk and eggnog. 3. Divide custard batter between 6 ramekins and place in large casserole dish. Add hot water to the dish until it reaches halfway up the sides of the ramekins. Bake for 40 to 50 minutes, or until a knife inserted into the center of the custard comes out clean. Serve cold or slightly warm. While the entire food blogosphere is blowing up with love for pie this week – and why not? pie IS glorious! 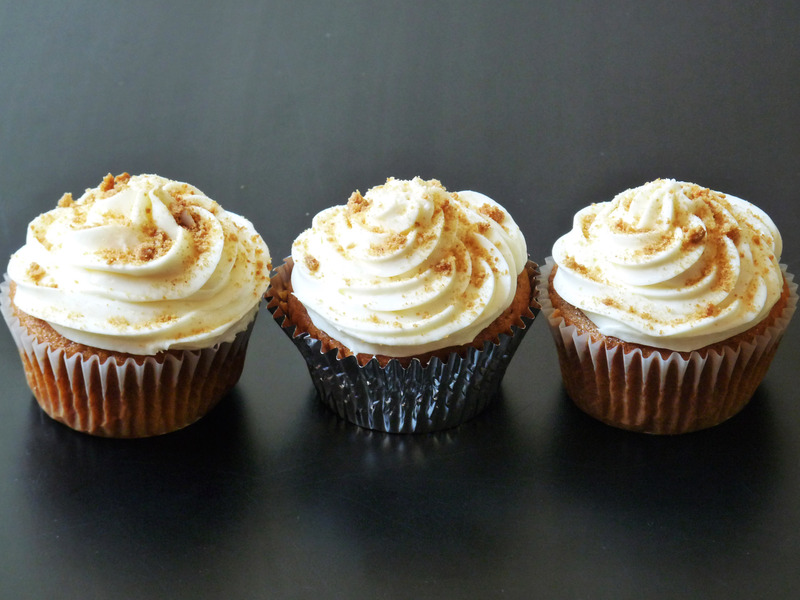 – I decided to shake things up a bit with a recipe for pumpkin cupcakes. Before I go any further, it’s time for a mea culpa: I, Brooke ____, usually make cupcakes from a box of cake mix. Yes, it’s true. The fact of the matter is, I LIKE how cupcakes from a mix taste, and I LOVE their soft, fluffy consistency. Is that such a crime? Well, sort of, particularly given the title of this blog (cucina fresca roughly translates to fresh kitchen, meaning the point is to make these dishes and confections from scratch). So, when preparing a dessert for an impromptu Halloween get-together last month, I wanted to expand my cupcake-making horizons. The result? Cupcakes softer, fluffier and better tasting than anything out of a box. Hallelujah! If you’re not in the market for pie this week – or would like to feature a pumpkin alternative at your Thanksgiving festivities – I highly recommend this recipe. Enjoy, and buon appetito! 1. Preheat oven to 350 degrees Fahrenheit. Line cupcake pans with paper liners; set aside. In a medium bowl, whisk together flour, baking soda, baking powder, salt and spices. Set aside. 2. In a large bowl, whisk together brown sugar, granulated sugar, butter and eggs. Add dry ingredients and whisk until smooth. Stir in pumpkin puree. 3. Divide batter evenly among liners, filling each about halfway. Bake until tops spring back when touched, and a cake tester inserted in the center comes out clean (approximately 20 to 25 minutes). Transfer to wire rack; cool completely before frosting. 1. While the cupcakes are baking and cooling, make the frosting. In a large bowl, beat together the butter and cream cheese with an electric mixer. With the mixer on low speed, add the powdered sugar one cup at a time until smooth and creamy. Beat in vanilla extract. 2. Frost cupcakes and, if desired, top with crumbled ginger snaps. As temperatures drop throughout most of the country (although not in southern California – it was 80 bloody degrees here today! 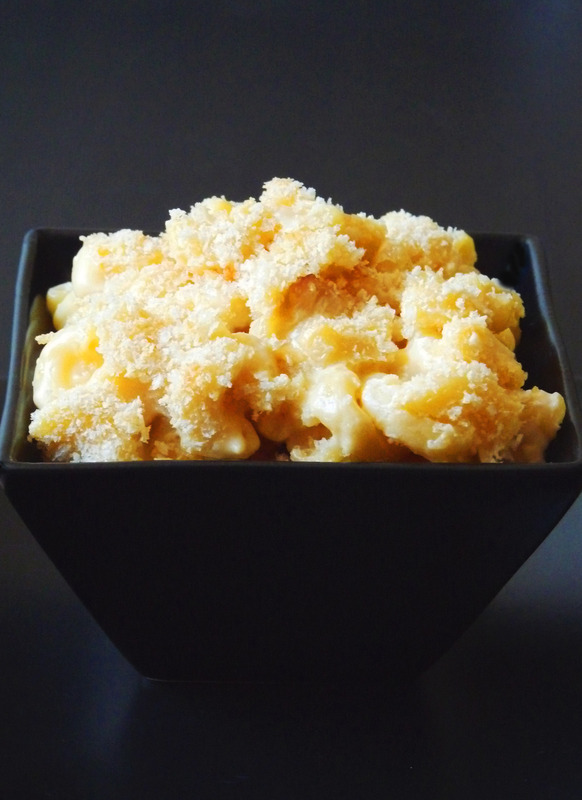 ), I thought it was time to feature a recipe for one of my all-time favorite comfort foods: macaroni and cheese. While there are roughly a zillion recipes for this classic pasta dish on the Internet, the one listed below takes on a decidedly French flair with the addition of béchamel and Comté cheese. The result? A rich, creamy, and delicious macaroni that will knock your freakin’ socks off. Seriously, make this immediately – I promise you won’t regret it! 1. Heat whole milk in a saucepan over medium heat just until it comes to a simmer. Remove from heat and set aside. 2. In a large, heavy-bottomed saucepan, melt butter over medium heat. Add the flour and whisk constantly until the mixture turns light brown in color (approximately 3 minutes). Remove from heat. 3. Whisking constantly, slowly add the hot milk to the butter-flour mixture until evenly combined and smooth. 4. Return the saucepan to medium-high heat and cook, whisking constantly, until the sauce thickens and coats the back of a spoon (approximately 2 to 3 minutes). Stir in one tablespoon of salt, taste, and add remaining salt if desired. Remove from heat and set aside. 1. Bring a large pot of heavily salted water to a boil over high heat. Add the pasta and cook until just al dente (approximately 9 minutes). Drain, rinse with cold water, and set aside. 2. Preheat oven to 400 degrees Fahrenheit (200 degrees Celsius). 3. Place the reserved saucepan of béchamel over medium heat. Stir in cheeses and mustard until melted and smooth. Add the pasta and stir to combine. Transfer to a 5-quart baking dish, sprinkle with panko, and bake for 25 to 30 minutes. I’ve been wracking my brain all week trying to write something clever and/or witty for this blog post, and I’ve officially got nothing. As in: nada, niente, nichts, bupkis. My conclusion? 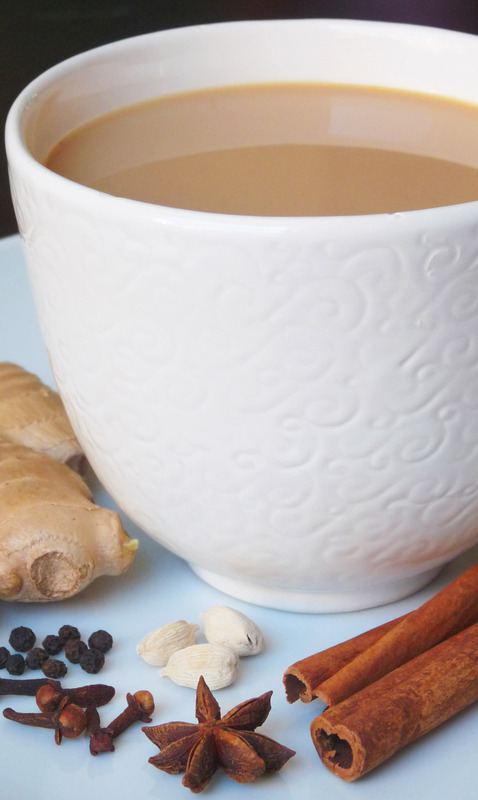 I’d rather sip my chai than write about it, and I’ve put off posting this recipe long enough. Without further ado, I give you – masala chai! Note: All of the following ingredients may be varied to suit individual tastes. When I make it again, I will probably omit the anise, add more cardamom and perhaps use slightly more brown sugar (I enjoy my chai very sweet!). Feel free to tinker around with this list – and add other spices, if desired – until you’ve made your perfect cup of chai. 1. Combine the first six ingredients in a medium-sized (preferably spouted) saucepan. Using a mallet or the back of a heavy spoon, lightly crush or bruise the spices. Add the water, milk and tea leaves, heating over medium heat until small bubbles appear around the perimeter of the pan. Stir to prevent the milk from scalding and continue heating until the chai comes to a boil. Turn off heat, stir well, and allow to steep for 3 to 5 minutes. 2. Divide brown sugar equally into three individual tea cups. Strain chai through a fine mesh sieve and pour into cups, stirring well before drinking.